LOCATION.--Lat 42°07'59", long 74°41'44" referenced to North American Datum of 1983, Delaware County, NY, Hydrologic Unit 02040102, on right bank 200 ft upstream from bridge on State Highway 28 in Dunraven, and 2.5 mi southeast of Margaretville. PERIOD OF RECORD.--October 1941 to September 1962, annual maximum only--1996, maximum only--October to November 1996, December 1996 to current year. REVISIONS HISTORY.--WDR NY-97-1: Drainage area. GAGE.--Water-stage recorder and crest-stage gage. 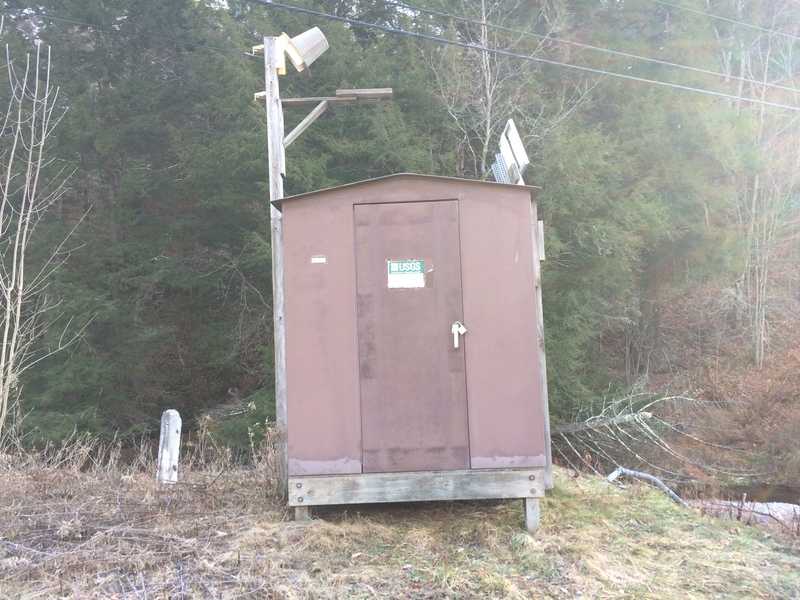 Datum of gage is 1,294.68 ft above NGVD of 1929 and 1,293.72 ft above NAVD of 1988. Prior to October 1996, at site 100 ft upstream at datum 1.55 ft higher. EXTREMES FOR PERIOD OF RECORD.--Maximum discharge, 5,690 ft³/s, Jan. 19, 1996, gage height, 9.60 ft, from floodmark, present site and datum (11.20 ft, from floodmark in gage well, site and datum then in use), from rating curve extended above 1,300 ft³/s on basis of contracted-opening measurement of peak flow; minimum discharge, 0.60 ft³/s, Sept. 10, 1997; minimum gage height, 1.83 ft, July 13, 2008.